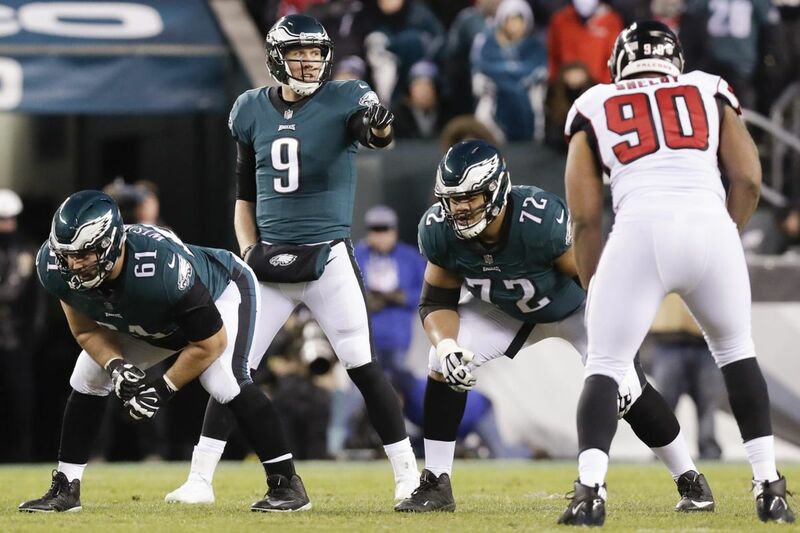 The film shows Eagles quarterback Nick Foles pointed the way to the win over Atlanta. Each week this season, we'll breakdown a player, trend or scheme from the Eagles' previous game using the coaches all-22 film. This week, we spotlight Nick Foles, who effectively carried out Doug Pederson's gameplan and helped quarterback the Eagles past the Falcons, 15-10, in the divisional playoff on Saturday. Many had doubted his ability to win in the postseason. Foles: It doesn't affect how I play or what I believe. … I am confident in myself because I know how hard we work and I know that we believe in one another in that locker room. Pederson and offensive coordinator Frank Reich's script of plays helped Foles stay confident even though he struggled in the first half. They got the ball out his hands quickly on one-or-two read-pass plays. They established the run enough to use play-action. And they balanced the play-calling to keep the Falcons on their heels. Pederson: The things that Frank and I had discussed and put together with the gameplan was conducive to some of Nick's strengths. It wasn't anything crazy or out of the ordinary from what we've done all season, but just plays where he was comfortable. The gameplan for Sunday's NFC championship will be tailored to the Vikings and will have wrinkles, as Pederson had for Atlanta. But the blueprint for Foles, who completed 23 of 30 passes for 246 yards, will be essentially the same. Can it work against the NFL's No. 1 defense? Yes. But it will be difficult to replicate. Minnesota, like all defenses, employs both man-to-man and zone coverage schemes, but coach Mike Zimmer tends to press his corners in man. Foles got into rhythm in the second half with a series of play-action passes and run-pass option throws that were effective against the Falcons when their corners played off in zone. Run-pass option plays are always a part of the Eagles' offense. With Carson Wentz, there were weeks when they were called often, weeks when they weren't. Foles has run option football since college. Reich: Nick is a great basketball player. He's a point guard. If he was playing basketball on the street, he's going to wheel and deal the ball. He's the guy out there. He can throw it behind his back with accuracy. He can give you the no-look pass. He can be looking one way and hit a guy. He has that knack and feel, and that's a little bit of the RPO game. After going three-and-out on the first drive of the second half, Pederson dialed up a play-action pass that resulted in a 12-yard Jeffery reception and followed that up with a 13-yard RPO to receiver on first down. Pederson: We didn't make a lot of wholesale changes at halftime. We just stuck to the gameplan. Nick started getting into a little bit of a rhythm in the second half, and things began to open up. The Eagles weren't killing it on the ground, but they had enough success to keep the Falcons honest. Foles completed 8 of 10 passes for 80 yards on play-action. Pederson: That's one of his strengths. He's good at that. He's a good, play action-pass quarterback. The Eagles' longest third-down conversion came later in the drive. They had eight yards to go and Foles likely would have to throw downfield to convert. There was some edge pressure, but he stepped up in the pocket and hit Jeffery, who had wrestled free. Jeffery, once again, ran after the catch and gained 21 yards. Foles' motions, while in the moment, were based on repeated drill work. Assistant coach John DeFilippo runs Foles and the quarterbacks through pocket movement drills nearly every practice. Foles: I felt really comfortable there. Just subtle movements in the pocket, working the pocket. Jeffery: He was in his comfort zone and just playing his game. The Eagles advanced to the Atlanta 19, but faced third and 10. Pederson called a pass play with high-low route concepts on each side of the formation. Foles' reads were based on coverage rather than progression, and he dumped almost immediately to Ajayi, who dropped the ball well short of the marker. If Foles had waited a click, he may have had Zach Ertz (No. 86, up top) on a corner route. The Eagles settled for a 37-yard field goal, but took a 12-10 lead. Reich: We're used to taking advantage of those opportunities, so any time we get down there and we don't score, we're disappointed. … Yeah, you look and you say, we could have done this, this or that. But the Eagles have coached Foles to not force throws. By design, he got the ball out quick all game. He averaged 2.27 seconds from snap to release, which was faster than any other divisional round quarterback. Pederson called five screen passes on Saturday. The first two– short flips to Ajayi and Corey Clement in the first half – picked up 9-plus yards. The third – a misdirection screen that had worked so well against the Falcons last season – was blown up. The third – similar to the first – picked up just three yards on second down. But Pederson called it again on third down. Pederson: Sometimes you can catch a group off guard when they don't expect two screens back to back. I've done it one other time in Kansas City with success. Buoyed by blocks from Jason Kelce and Stefen Wisniewski, Ajayi motored for 32 yards. Pederson: The screen game has been something we've worked on the last couple of weeks, and it had to get better as the season wore on for us. Three plays later, the Eagles faced another third down. Pederson must have saved this play for the right moment. Ertz was split wide alone up top opposite three bunched receivers. Safety Ricardo Allen pressed. Ertz fended off the safety's bump and ran a slant. LeGarrette Blount's release out of the backfield drew linebacker Deoin Jones and cleared a throwing lane for Foles, who hit his tight end in stride. The Eagles' extra week of practice after the regular season may have benefitted Foles, who struggled against the Raiders and the Cowboys in the final two games, more than any other player. Kelce: Everybody talked about the last two weeks of the season and I tried to say this: The guy had almost no reps. We're resting everybody, everything's a walkthrough because we're trying to save people's legs before games and before the playoffs started. … It was huge this week and last week for him to be able to get those practice reps and build some continuity with the receivers. The Eagles have increasingly lined Nelson Agholor up outside and Jeffery in the slot in the red zone to switch things up and to create mismatches. They tried it on the previous red zone possession to no avail and again here. The Falcons dropped seven into coverage and had the Eagles' blanketed in the end zone. Foles checked down to running back Clement – who had converted a third and three in the second quarter with yards after the catch – but he was stopped short. Reich: The one pass we had called down there that we have had so much success with, not the exact call but a variation of a call, they covered it pretty well. … So we threw it underneath. It was the right place to go with the ball but it just came up short. The Eagles tacked on another three points and the defense would hold for the victory. If Foles had repeated his first half, however, who knows if they would still be alive. Pederson's most aggressive decision, aside from maybe going for it on fourth down at the 1-yard line, may have come on the Eagles' first play from scrimmage. Pederson: The first play of the game was a play action-jet sweep. It was a gutsy call to have Foles throw into the wind. His deep throw died in the wind and landed well short of Torrey Smith. But Falcons cornerback Brian Poole knocked Smith to the ground as he went back for the ball. Falcons quarterback Matt Ryan had trouble throwing into the wind, as well. But it would be the longest throw for Foles, who was 0 for 3 on passes 20-yards or longer. Foles: I saw the flags, but I felt fine all day. Ajayi fumbled a play after the pass interference penalty. A series later, Foles threw high of Ertz on a short flat route. Foles: I think the thing in the first half is we made a few mistakes that hurt us a lot. Later in the drive, Foles and Blount had a bad exchange and the Eagles lost seven yards on first down. A 10-yard pass on second down led to a third and manageable, but Foles, who was protected nearly all game, was sacked. The Falcons did an excellent job in coverage. Foles' internal clock probably should have told him to escape, but the pocket collapsed on him. It was one of seven times he was pressured on 31 drops. Of the divisional playoff quarterbacks, Foles was under duress the least, but when so, he completed 4 of 6 passes for 49 yards with the sack. Ajayi: He wasn't rattled. Every time on the sideline he was composed. Ajayi's early success on the ground allowed Pederson to call one- or two-read throws during the Eagles' only drive for a touchdown. Foles' average pass length was 5 yards. His average pass per completion traveled 3.65 yards. The sample is obviously small, but both numbers would have easily been last among all qualifying quarterbacks in the regular season. The Eagles, though, averaged 7.04 yards after the catch, which would have been first in the regular season. Is that formula sustainable? Reich: Every game's new. … That was one of the things that I think we excelled at was the run after catch. That point was made to our players [Tuesday]. Just the aggressiveness with the ball in their hand, protecting the ball, but that is always going to change week-to-week depending on coverages that are being played, depending on the flow of the game. In the final four regular season games, Foles completed only one pass that traveled more than 20 yards. He had a second half opportunity when tight end Trey Burton juked safety Keanu Neal and released into space. But Foles' pass sailed wide. With 22 seconds before the half, Foles threw deep down the middle to Ertz, but he wildly missed his target and should have been intercepted. Neal botched the would-be turnover and the ball deflected off his foot to Smith for a 20-yard gain. But when he needed to get into field goal range with seven seconds left, Foles lofted a 15-yard strike to Jeffery with one tick on the clock — on a play call similar to the one in which Wentz hit the receiver to set up Jake Elliott's game-winning field goal against the Giants in September. Foles: You want to hit it on the sidelines because I think at that point we didn't have a timeout. Jeffery: It's just something that we practice all the time. Foles' performance won't win any beauty contests, but if he can be as efficient against the Vikings, the Eagles could be Super Bowl bound. Pederson: There is a great surrounding cast around him, and he doesn't have to do it himself. It's not about one guy. … It was a great example of that great team effort the other day. Was it perfect? No, but at the end of the day, we won the game, and we found a way to win the game, and that's all that matters.